Perhaps you have heard of borscht, the Eastern European sour soup made with beets. The word barszcz in Polish means "borscht," but this soup is slightly different; whereas traditional borscht is an opaque purple and commonly includes meat, tomatoes, and cabbage, barszcz is more of a basic beet broth that is somewhat translucent, whether red or white in color. Traditional barszcz is sometimes made with a kwas or sour starter. If the soup is red, then the kwas is made with fermented beets (this is known as a kwas buraków). If the barszcz is white, it is made with fermented rye flour or rye bread, which is known as a żur or kwas chlebowy. 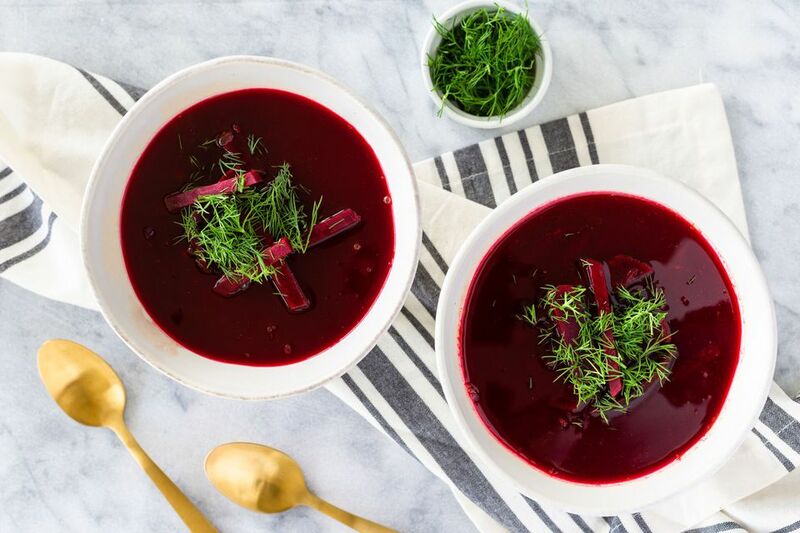 This easy, clear red Polish beet soup recipe doesn't use a sour starter, but instead gets the desired hint of sourness from lemon juice or vinegar, and is great eaten hot with boiled potatoes or cold with rye bread. This meatless soup is often served with mushroom uszka ("little ear" dumplings) for Polish Christmas Eve dinner (known as wigilia); the soup is then referred to as barszcz wigilijny. If using fresh beets, heat oven to 400 F. Wrap beets in aluminum foil and roast until tender, about 30 to 45 minutes. When cool enough to handle, peel, and slice into strips or julienne. In a medium pot, bring meat or vegetable stock to boil. Add sliced beets, garlic, sugar, lemon juice, and salt and pepper to taste. Simmer 10 minutes. Serve hot with boiled potatoes and garnish with chopped dill. What distinguishes Russian borscht from barszcz is that borscht is often served with sour cream and can be served cold, while barszcz does not usually have sour cream added, and is most often served hot. That being said, there is a version of this soup called barszcz zabielany that is creamed and served cold. Simply cool the soup in an ice-water bath and refrigerate. Then serve cold garnished with dill and sour cream. White borscht, known as biały barszcz or żurek wielkanocny (Easter sour soup), is made with white kiełbasa cooking water, potatoes, sour cream, sausage, and hard-cooked eggs. White barszcz features a żur, which is similar to a kwas, only a żur (also known as kwas chlebowy) is made by fermenting rye flour or bread with water in a jar or crock for up to five days. If you have an affinity for beets, there are many other recipes to try other than borscht. Polish beets with sour cream (buraczki z smietana) is a beet side dish that becomes a brilliant shade of magenta with the addition of sour cream and dill. Perfect on a hot summer day is this Lithuanian cold cucumber-beet soup, a no-cook cold soup made with buttermilk. For Polish pickled beets (buraczki marynowane), choose small, young, blemish-free beets; you can either can them whole or slice up larger ones and place them in the sweet-tart brine before processing.